An original single-seat Rutan Quickie. This example is in the Canada Aviation and Space Museum. 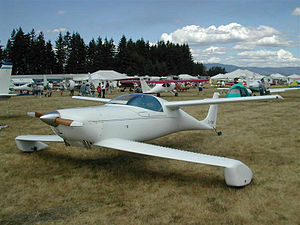 The Quickie Q2 or Q2 is a two-seater version of the unique Rutan Quickie, produced in kit form by the Quickie Aircraft Corporation founded by Tom Jewett and Gene Sheehan. Canadian Garry LeGare was involved in the design. The Q2 is a tandem wing design, having one forward wing and one rear wing (instead of the more usual main wing and horizontal stabilizer). The elevators are fitted to the forward wing so that all pitch control comes from the forward wing, similar to the canard configuration. The Q2 is a "taildragger" with fixed (non-retractable) main wheels faired into spats located at the tips of the forward wing. As efficient as the original design, the Q2 is also of composite construction. The Q2 followed Jewett's and Sheehan's intention to design a two-seat homebuilt aircraft. A homebuilder who had already built a Rutan VariEze, LeGare suggested a two-seater development of the Quickie with a larger VW engine. At the time, Sheehan and Jewett were not interested so LeGare took it on himself to build one. Unlike the original single-seat Quickie, Rutan was not involved with design of the Q2, but it retains the Rutan tandem wing solution to the design issues of low drag, with fixed undercarriage and a useful centre of gravity range. This also places the payload close to the centre of gravity, incorporates the wheels without much drag penalty and gives safe stalling characteristics. The Q2 is a "taildragger" with fixed (non-retractable) mainwheels faired into spats located at the tips of the forward wing, acting like endplates (increasing effective aspect ratio). The absence of separate landing gear reduced both weight and drag. However, propeller ground clearance is limited and the Quickie is rather vulnerable to prop-strikes. The full-span elevators are fitted to the forward wing so that all pitch control comes from the forward wing, similar to the canard configuration.. The forward wing provides about 60% of the lift. The ailerons are located inboard on the aft wing which is shoulder mounted centrally just aft of the pilot. The canard layout provides positive lift from both pairs of wings, whereas a conventional tailplane supplies negative lift. Pilot controls included a central sidestick and a throttle on the left. The rudder pedals are linked to the steerable tailwheel which remains useful up to the point of takeoff as the Quickie does not lift its rear during the takeoff run. The prototype Q2 was constructed in Canada by Garry LeGare at his Leg-Air Aviation, Ltd., facility in Langley, British Columbia. The airplane is constructed of glass fibre and resin over a foam core, like other Rutan designs; the wings are foam blanks cut to shape with a hot wire before covering and the fuselage made up of one inch-thick foam slabs. In June 1978, only two months after the single-seat Quickie prototype's first flight, Jewett and Sheehan had formed the Quickie Aircraft Corporation to produce and sell complete kits of Quickie layout, first single then two-seaters. Kit production commenced in 1980, with over 2000 kits sold before production ended. LeGare and Quickie formed an agreement: while Quickie handled domestic sales within the US, LeGare would handle export sales. In practice the export sales were shipped directly from Quickie in California. This two-seater has a 64 horsepower (48 kW) Volkswagen air-cooled engine and can be constructed as a Tri-Q with tricycle rather than conventional landing gear. This two-seater model is faster than the Q2 with a 105 horsepower (78 kW) Continental O-200 engine and uses a different airfoil for the canard. The Q-200 is designed to be powered also with other engines including Mazda, Subaru, Rotax, and Corvair engines in the same horsepower range. It can also be constructed as a Tri-Q with tricycle rather than conventional landing gear. ^ "Quickies catch on fast". flightglobal.com. Retrieved 31 December 2018. ^ Canada Aviation and Space Museum (n.d.). "Quickie". Retrieved 2008-10-01. ^ Kocivar, Ben (August 1981). 180 MPH Kit Canard. Retrieved 2010-02-28. ^ "Canard Advantages and Disadvantages". Desktop.aero. Archived from the original on 2012-07-22. Retrieved 2012-06-13. ^ Air Progress - April 1981, Peter Lert How About A Quickie For Two? ^ ""Quickies catch on fast". flightglobal.com. Retrieved 31 December 2018. ^ "Q2/Q-200". www.quickheads.com. Retrieved 31 December 2018. ^ "General Aviation". www.evergreenmuseum.org. Retrieved 31 December 2018. ^ "What are the specifications for a Q2?". Quickie Builders Association. Retrieved 2006-04-14. ^ "Quickie 2 C-GIKP". Western Canada Aviation Museum. Retrieved 2006-04-14. Wikimedia Commons has media related to QAC Quickie Q2. This page was last edited on 31 December 2018, at 12:48 (UTC).